• Write a brief introduction in your own words using information from the question and the headings in the graph. • Divide the main body of your report into two or three paragraphs describing the key information in the graph. The first paragraph should list your main points. Secondary points and observations regarding surprising or interesting information should follow in subsequent paragraphs. • In the exam, you might be asked to describe two graphs. If this is the case, you need to compare and contrast the information and make connections between the two. 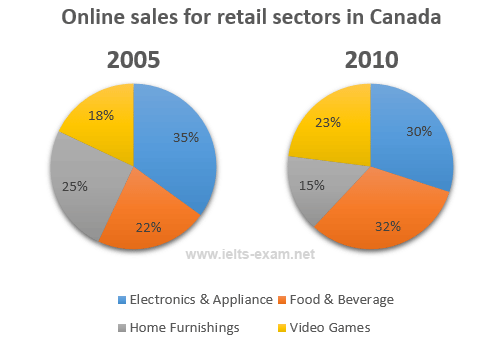 The two pie charts compare the percentages of online sales across different retail sectors in Canada in the years 2005 and 2010. For three of the sectors, it is evident that over this time frame there was significant change in their proportion of online transactions. At 35% we can see that electronics and appliance sector accounted for the majority of online sales in 2005, but this percentage had dropped to 30% by 2010. During the same five-year period, as an increasing number of people chose to purchase food and beverage online, we can see that transactions went from just 22% to 32%, making it the retail sector with the largest overall proportion of the online market. In 2005, the home furnishing industry boasted an impressive 25% of the total online sales in Canada. However, by 2010, the figure had fallen considerably to 15%. Interestingly, online sales of video games eventually overtook sales of home furnishings, although video games still represented only 23% of the market.